Description: By #1 New York Times bestselling author Holly Black, the first book in a stunning new series about a mortal girl who finds herself caught in a web of royal faerie intrigue. 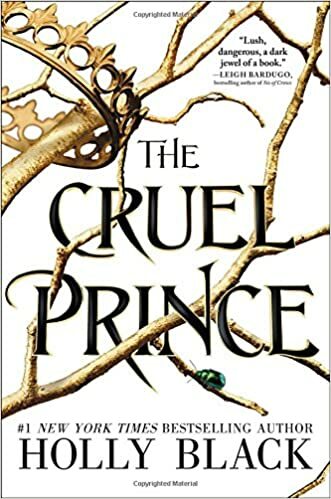 My Thoughts: THE CRUEL PRINCE is an intriguing fantasy that starts a series. The main character is Jude Duarte. She watched a fairy named Madoc kill her parents in order to gain control of her older sisters Viviene who happens to be his daughter. Rather than leaving them on Earth, takes Jude and her twin sister Taryn back to faerie with him too. Ten years have passed and Jude and Taryn have found different ways to cope with the dangers of being human in faerie. Taryn is looking to marry and become a consort. Jude wants power of her own and to control her own life. She has decided that the only way to survive is to out-evil the fae around her. Madoc is a red cap and one of the high king's generals. He has taught Jude strategy and tactics and to use a sword. She has very mixed feelings about him. She hates him for killing her parents but she has known him to take a father's care of her for ten years. Through the years she and Taryn have become the victims of a set of the younger fae including Prince Cardan who is the youngest son of the king. He becomes her biggest rival but his cohorts especially Valerian and Locke are the more overtly dangerous. Valerian has tried to kill her a number of times and Locke seems to be trying to seduce her for some reason. Their constant harassment hones her terror and her determination to make a place for herself in faerie. The high king has decided to abdicate his throne which makes the political maneuvering even more dangerous for Jude. She is recruited by Prince Dain, who is the heir apparent, to be his spy. He puts her under a geas to keep her from talking about him and his plots but which also makes her immune to enchantment by other fairies. As she conducts missions for him, she finds some clues that puzzle her and make her wonder if she really knows what is going on. This tale is twisty and Jude's life is in so much danger. Her life in faerie has twisted her into something that she isn't sure she likes but she doesn't see another path. I liked the secrets that were gradually revealed. The story was intriguing and kept me reading late into the night. I can't wait to find out what comes next for Jude. I want to read it!! It sounds amazing!